Seek not the face of the Priest in the Mass, but the face of Almighty God! Every year, on the first Saturday of Advent at 6:00AM, we come together as a Parish Family to celebrate the unique European tradition of the Rorate Mass. Our Church will be illuminated with only candlelight as we celebrate Mass in the Extraordinary Form (Traditional Latin) and anticipate the beauty of another dawn. Below you will find information about the Mass and its rich meaning and symbolism. I hope that you and your family can participate in this spiritual tradition which is another opportunity for us to grow this Advent Season as we await the birth of Our Savior on Christmas day! The Rorate Mass got its proper name from the first word of the Introit (Entrance Antiphon): “Rorate caéli desuper et nubs pluant justum.” “Shower, O heavens, from above, and let the skies rain down righteousness.” We know Gaudete and Laetare Sunday which also got their names from the Introit. Before the liturgical changes after Vatican II this Mass was celebrated very early in the morning on all Saturdays. In some areas it was celebrated on several or even all weekdays during Advent. Origins: The Rorate Mass has a long tradition in the Church, especially in German-speaking countries. It is a Votive Mass in honor of the blessed Mother for the season of Advent. Our lady shows herself in a special way as our leader through Advent to Christmas. The celebration by candlelight had originally a more practical reason. According to the Missal of 1570 no Mass could be said after 12:00 Noon. On the other hand, people had to go to work in the morning. Also, the Rorate Masses were celebrated in a more solemn form and therefore would last longer. For these reasons the Masses had to begin relatively early in the morning when it was still dark due to wintertime. Symbolism: There is a beautiful symbolism associated with the Rorate Mass. Through the snow and cold and darkness of early morning the faithful would trudge with lanterns and candles in their hands to the then brightly lit Church (no electric light!) where the Mass was celebrated. Marian Dimension: In Advent we live spiritually between the Annunciation and the birth of Christ. Mary teaches us the spirit of Advent. During the nine months of pregnancy Mary lived a hidden life, in the spirit of silence and intense intimacy with Christ she carried in her womb. This spirit of intimacy with God the faithful are to cultivate during the Season of Advent more intensely by listening attentively to God’s message and by obedience to His word. 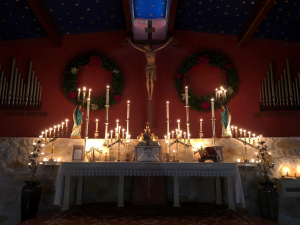 Rorate Mass Today: Today this Mass with candlelight can either be celebrated in the morning or in the evening when it is dark, because there is no restriction any more with regard to the hours Mass can be said. In fact, it is frequently celebrated in German-speaking countries because of its popularity. Popular piety attributed to these masses a special efficacy and they were held in great esteem. People would ask these Masses to be said for their intentions far in advance. Use of Candles: What we see so often in Church history: certain things have been done first for practical reasons, but then in the course of time there was also attributed a spiritual meaning. And the use of candles during Advent belongs into this category. The symbolism of the candle matches very well with the spirit of Advent. Advent is dawn. It is still not the bright light of Christmas. Advent is a time of preparation for something exceedingly joyful that will be going to happen. The Church and the soul are still struggling through the darkness toward the Light. There is a longing and expectancy of Advent. The light of our candles is a symbol for our longing for the coming of our Savior whose light is already dawning. On Christmas Eve we will enter the Church in procession by candlelight. When the Gloria is sung all the lights will be turned on meaning that Christ is now born.